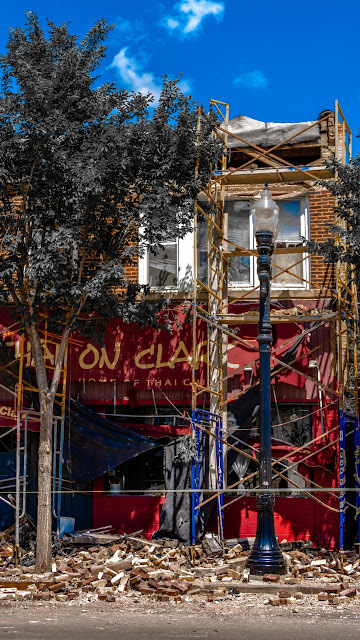 The top of the brick facade at 4641 North Clark fell off the building earlier today, covering the sidewalk and part of the street with debris. There had been scaffolding in place for the past few days, as the facade and roof were undergoing renovations. The police and building inspectors showed up quickly, and within a few hours the rubble had been cleared away. The area surrounding the building has been taped off for safety. The apartment above Thai on Clark, as well as the restaurant, look to be in good condition, although the restaurant awning took a hit. 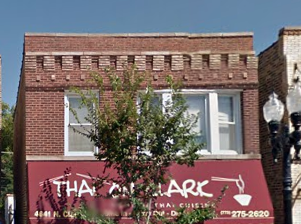 If you plan on going to Thai on Clark anytime soon, we suggest calling first to make sure they are open. We haven't heard of any injuries, either inside or outside the building. Thank you to reader Bill Biederman for the photo. A case of too many Chicago freeze-and-thaw cycles.